Hawaiians at Heart — Kaliko, Leokane, CH Boom, EKK Kauai 2013. As always, seating is limited at the Kaua’i Beach Resort; anyone wanting a seat should be there well before 7:00 pm! ! ! The 6:00 – 7:00 ‘ukulele hour will feature instruction by all three outstanding young ‘ukulele artists — Aldrine Guerrero, Kalei Gamiao, and Taimane Gardner. Whether you are clued in on attending an EKK Monday by the man in the hotel hot tub, a woman at the Farmers’ Market, someone sitting across the aisle on the plane, the sales person at Kaua’i Museum, one of many hotel concierges or by your reliable friends and family, once you experience the aloha and magic of E Kanikapila Kakou, you too will be one of our army of word-of-mouth sales people for this very unique program . . . truly, the only one of its kind in the State of Hawai’i. Mahalo to the Hawai’i Tourism Authority and the Kaua’i Office of Economic Development for supporting Garden Island Arts Council with the seed funding; mahalo to Kaua’i Beach Resort for inviting GIAC to rent the Jasmine Ballroom; mahalo to the EKK patrons for stepping up to the plate with money where their mouth is; mahalo to all who attend and make this the most appreciative audience that Hawaiian music artists could hope to experience. We hope to see you again next January 2014. Harmonious strains of Na Ka Pueo swept through the audience with such emotional power and exquisite harmony that one could imagine walking through a Hawaiian rain forest with the sounds of the Hawaiian owl calling out from everywhere. If that was the only song sung, it would have been enough, but there was a lot more. 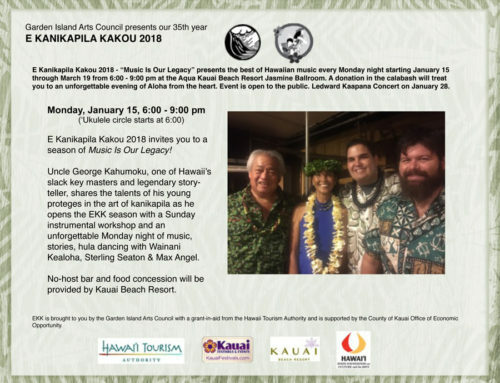 This song with lyrics by Samuel Kalani Ka’eo set the tone for the entire evening of beautiful songs, hula and stories by what developed into an entire musical contingent that materialized just a few hours before the program. It started with two years of trying to get Leokane Pryor of Hana, Maui to present together with Kaliko Beamer Trapp of Hawai’i Island because I knew they collaborated on some beautiful songs. Having just completed his Na Ka Pueo CD with CJ Boom Helekahi, Leokane asked to add CJ to the presenting artists. Kaua’i’s eminent kumu hula Kehaulani Kekua, long time friend and collaborator of Leokane, was also invited to add some hula to the program; 15 dancers from Halau Palaihiwa O Kaipuawai joined the party. To make the musical accompaniment as rich and full as possible, Aikane Alapai on guitar and Mike Odo on bass were invited to join the line-up. With just a couple of hours of rehearsal before the show, the program presented was truly Kanikapila Hawaiian style! Way to go! Love songs of their home in remote Hana and other Maui sites reminded us how special is this place we call home. Aloha Honokalani written by the late Charles Ka’upu with music by Leokane is a fast-paced lively number that showed off their beautiful harmony; Home Malanai describes his home in the peaceful Maka’alai area where Leokane takes his dogs for daily walks along the shoreline. Ka Beauty O Maka’alea, a nahenahe melody speaks of the peacefulness and of a specific wind of that area; Kehaulani who met Leokane when she did a blessing of his property 12 years ago, interpreted the lyrics in a beautiful auwana hula. A number of collaborations between Leokane and Kaliko have resulted in some extraordinary songs. Kaimu, my all-time favorite Leokane song, describes the warmth and friendship of Kaimu and of the home still standing there today, spared from the lava flow when Pele took a sudden left turn, missing the house, and wiping out the whole beach. Nani Malia is about a precious niece much loved by her family. Aloha no’o Hana was written when Leokane visited from California for Aloha Week and fell in love with Hana. Hana became his home. Kehaulani was moved to dance when she heard the song; she graced the stage with a hula that she choreographed many years ago in Leokane’s living room. Malaekahana is a song about the beach that Kaliko wrote while sitting on a log; Leokane showed up and composed a beautiful melody for the lyrics. Ke Ho’olono Nei with original lyrics by Suzanne Case, music by Leokane, and Hawaiian poetic adaptation and translation by Kaliko is a poignant song about the last of endangered birds who could not find a mate and thereby became extinct. A native of Hana, CJ Boom Helekahi is a gentle giant with a smile that does not quit; he grew up in this remote little village at the bottom tip of Maui, went to school in Lahainaluna at the top end of Maui, went away to college and returned home only to find that something was missing for him. He left once more to the continent but that lasted only three months. He returned to his birthplace with renewed love for his hometown. With the passing of his Dad at this time he poured his emotions into the song Ku’u Home Aloha, undeniably an emotional love song for his home. Other songs professing his love for his home followed and are recorded on his Ka Mahina CD. CJ’s home became Leokane’s home as his family took the mainland boy into their fold and nurtured his Hawaiian heart; their friendship and musical collaboration continues to this day. Hakumele 101 was a workshop session taught by Kaliko Beamer Trapp during the first hour. A small group of about 15 sat in a circle and by the end of the hour had composed, complete with leo, a hakumele that they bravely performed on stage. He must have touched a soft spot in Aunty Nona’s heart as they kept in touch, Kaliko attempting to write a love song in Hawaiian for someone with whom he was infatuated. In her characteristic manner, Nona red-marked every line and sent it back to Kaliko. Kaliko’s family moved back to England leaving the 17-year-old lad alone in SF; he survived by living with 14 Tongans in a small room . . . admitting he really learned a lot from that experience. In time Aunty Nona told Kaliko he should come to Hawai’i; he did so on a cruise ship. Under her tutelege he began to study the Hawaiian language and went everywhere with her to perform, teach and share Hawaiiana. Before she passed away in 2008, Aunty Nona saw that Kaliko was officially and ceremoniously brought into the Beamer Family as her hanae son. He shared songs by Helen Desha Beamer, Aunty Nona’s grandmother, Keawa’iki, which she composed on her way to visit Francis I’i Brown. He also touched on how she simplified Pupu Hinu Hinu, originally a chant about tree snails, so little children could sing it easily. He also shared a story of how John Lennon’e Imagine now has Hawaiian lyrics which his brother Keola Beamer asked him to write during lunch for a concert four hours later. Written on a napkin, the song was performed in Hawaiian by Keola and Raiatea. The lyrics now belong to Yoko Ono. Kaliko did a super job of singing the Hawaiian Imagine. Obliging my request for a Na Lani Eha song, the group sang Leokane’s interpretation of a medley of Sanoe by Queen Lili’uokalani and Ku’uipo i Ka H’e Pu’e One by Miriam Likelike. I’ve already put in another request that next time he comes to Kaua’i, he will sing ‘Ainahau and Ku’u Pua Paoakalani. Mahina ‘O Hoku with music and lyrics by Lillian Awa is one of the many songs that the halau dancers interpreted with their hula. Holo Holo Ka’a, Aloha Kaua’i, Haleakala Hula and Puamana are some of the songs interpreted in hula by the halau. What an unexpected and wonderful treat it was to see the songs danced. Dancers in the audience came up for Aloha Kaua’i; Puamana was the dance taught by Kehaulani during the ‘ukulele hour so the stage was filled with dancers and ‘ukulele players for the grand finale. E Kanikapila Mondays often start very small with the planting of a seed or two and blossoms into a fabulous evening of songs, stories and dance . . . another all-out party as we move toward our last Monday night. Thirty years ago I could count the musicians I knew on one hand, so the late Kaleo Kakalia took on the task of recruiting Hawaiian musicians for EKK. He told me that Hawaiian music has many different styles so he wanted to show that in his choice of artists. This has stood me in good stead as over the years we have shared many different styles of Hawaiian music — oldtime favorites, song by famous composers, top of the line slack key artists, ukulele stars, incredible falsetto singers, authentic chanters, kumu hula and their halau, himeni, hakumele, rare Niihau music, backyard musicians, hapa-haole musicians, steel guitar, duos, trios, Waikiki-style entertainers, world style music, bluesy, jazzy, and almost rock — you name it, you got it. In addition to the weekly Mondays, we have sponsored numerous ground-breaking concerts for Kaua’i. Kuleana music is bringing back The Hawaiian Legends to KCC PAC on Sunday, April 7; GIAC gives a thumbs up on this concert! Ledward Kaapana, Nathan Aweau, Dennis Kamakahi and Mike Kaawa on the stage together — how much better can it be? Advance tickets available on Monday, March 25, at EKK entrance.